So there you have it, Kim Si-woo is the Players Championship winner at the tender age of 21. England's Ian Poulter pushed him close, as did Louis Oosthuizen, but there was no doubting the man in control on the final day. Cool, composed, classy stuff from the Korean, who has a promising future ahead of him. As for us, it's time to say goodnight - but you can recap on all of today's action right here. Louis Oosthuizen held a share of the lead heading into the weekend action, the South African eventually finished tied second with Ian Poulter. But he witnessed Kim Si-Woo's victory first hand, pairing up with the 21-year-old on the final day. 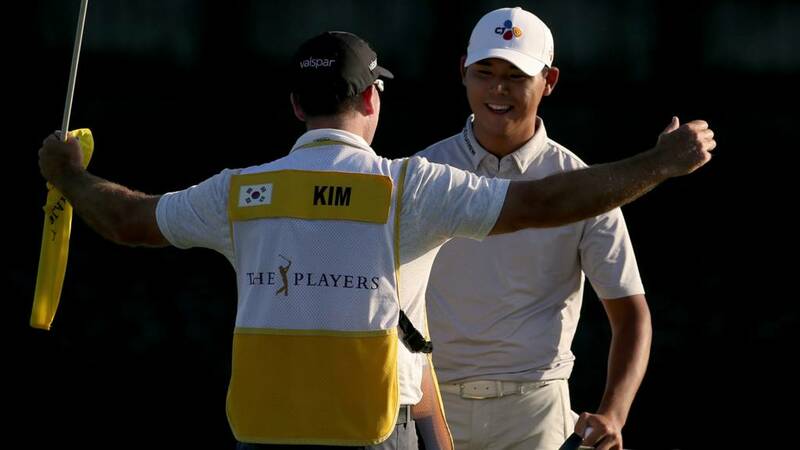 So what does that Players Championship win mean to Kim Si-woo? "I feel like I'm still dreaming," he tells Sky Sports. "I never expected I was going to win this tournament. "I wasn't doing that well at the beginning of this year, but I'm so excited I can be the champion. "It was a great experience for me that I won one of the championships last year and today because of that experience I could be stable and focus on myself and not try to think about other scores - that really helped me to be stable." The crystal Players Championship trophy is out, Kim Si-woo's name is being etched on to it. This is the 21-year-old's second win on the PGA Tour, but by far his biggest. He'll pocket £1.47m for that win - not a bad week's work. Amid all the excitement of Kim Si-woo's win, there's still two players to finish their rounds. JB Holmes is the first, but he's double bogeyed - and that follows a triple at the 17th! What a shocking round from Holmes, who finishes on 84 for the day. He was one of the co-leaders after Saturday's third round, but signs off on three over par. Kyle Stanley still has a shot at a share of second place. The American's got a birdie putt on the 18th, it runs right up to the cup... and stays up. He'll settle for tied fourth on six under. Ian Poulter speaking to Sky Sports about his remarkable bogey at 18: "You don't want to be over there, it was a crazy shot. I was so frustrated to find myself over there. It comes out of nowhere. "To pull it off was a great shot." On his week at Sawgrass: "It's been a great week, to be in a position a couple of weeks ago where I wasn't here to now at tied two - it's been a great week. "It has been tough - a tough 18 months. Today I felt a couple of putts slipped by. I played well under pressure barring that second shot at the last. "I've had the kids up here and had some fun on the beach, it's taken my mind off things. I'm enjoying my golf and hopefully this is a stepping stone for this year." App users may need to click through to view post. Finally we see a smile across the face of Kim Si-woo! The 21-year-old whips off his cap, embraces his caddie and let's out a beaming grin as the Sawgrass support shows its appreciation. He still looks the calmest man on the course, mind. The Spaniard not been on form at all today, having been in contention at the end of round three. In what is a fitting end to his day, he finishes with double bogey on the 18th. With rounds of 73, 71, 67 and 78, he is one over for the tournament. Kim Si-woo confidently struts up to his ball and tickles it towards the pin. Louis Oosthuizen tucks away his par to stay tied second with Ian Poulter, but everyone's focus is on the 21-year-old from South Korea. He stands over his putt, eyes on the prize, and tucks it away. Fantastic stuff. We shouldn't have expected anything less, as Kim Si-woo clips an approach up just short of the green and then sets about his walk up the 18th fairway. He remains calm, composed, as he has throughout Sunday's round. Louis Oosthuizen will play first, he's tied second at seven under. What a bogey from Poulter! Only his sixth in the entire championship, the lowest of anyone in the field. A fantastic round from Ian Poulter, but it's Kim Si-woo with three shots to play with. Only a monumental collapse will stop him winning the Players Championship now. Ian Poulter has taken an unplayable. He gets the drop on the bark - what can he do from here? Unbelievable! Poulter curls one between a corridor of trees and it fixes its sight on the pin. Surely not? So, so close for the Englishman. That looked for a long time like it might drop. It finishes a foot away. That's fist-pumping stuff from Poulter, who slams his club to the ground in celebration. He taps in for bogey. What a fantastic tournament he's had. Kim Si-woo has the water to his left, fans scrambling to watch him to the right. All he sees is the fairway, and that's exactly where his tee shot heads. Another flawless tee shot from the 21-year-old. Plenty of fans offering up a hand for a high five from the leader en route to the 18th tee. Ian Poulter was there a few moments ago, now he's in a bush at the other end of the hole. That'll be music to Kim Si-woo's ears. Poulter's looking for a way out. This is troublesome. "Initially I didn't think I got the perfect bounce and I didn't know if I got it in or not and then I saw the crowd. "Lots of adrenaline flowing after that shot, I just wanted to enjoy it, let it out. "The fans come here to enjoy themselves so why not enjoy myself with them as well." Kim Si-woo on the 17th then. The hard work surely already done having found the green. It's a long, long way from the cup, but Kim rolls his putt up to within four feet and with the consistency he's shown today you'd fancy him to clock off another par. He does. Safely through the 17th. On to the last.